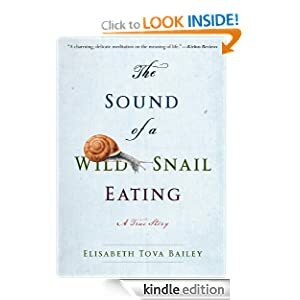 In a work that beautifully demonstrates the rewards of closely observing nature, Elisabeth Bailey shares an inspiring and intimate story of her uncommon encounter with a Neohelix albolabris -a common woodland snail. While an illness keeps her bedridden, Bailey watches a wild snail that has taken up residence on her nightstand. As a result, she discovers the solace and sense of wonder that this mysterious creature brings and comes to a greater under standing of her own confined place in the world. Intrigued by the snail-s molluscan anatomy, cryptic defenses, clear decision making, hydraulic locomotion, and mysterious courtship activities, Bailey becomes an astute and amused observer, providing a candid and engaging look into the curious life of this underappreciated small animal. Told with wit and grace, The Sound of a Wild Snail Eating is a remarkable journey of survival and resilience, showing us how a small part of the natural world illuminates our own human existence and provides an appreciation of what it means to be fully alive. Elisabeth Tova Bailey’s essays and short stories have been published in the Missouri Review,Northwest Review, and the Sycamore Review. She has received several Pushcart Prize nominations, and the essay on which this book is based received a notable essay listing in Best American Essays. She lives in Maine. Also you can get a cool game for your kids on your Kindle Fire which called First Puzzles HD Pro. 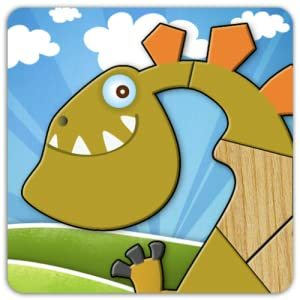 Clever Kids First Puzzles HD Pro is a fun and simple educational game for children from 2 to 10 years old. Kids will learn new words, shapes, and correct spellings as they explore such exciting places as the farm, the ocean, and the world of the dinosaur. Playing is simple: drag the pieces of each puzzle around to create a picture, and fill in the animals that inhabit each scene. This app will also help your child spell each word. Kids can choose from three fun puzzle worlds to work in. Down on the farm, familiar characters like cows, pigs, and hens are waiting to be placed in their correct puzzle positions. In the ocean, you’ll find lots of friendly undersea creatures like an octopus, crab, starfish, and sea turtle. And if you’re feeling especially brave, go back in time to the domain of the dinosaurs! This prehistoric world features a smiling Stegosaur, affable Apatosaurus, and remarkably un-scary Tyrannosaurus Rex, along with several other lovable dinos. Whichever puzzle your child decides to work first, she or he is sure to have fun. Get started now and see which puzzle becomes your kid’s favorite! This entry was posted in Kindle Applications, Kindle Apps, Kindle Books, Kindle Daily Deal and tagged Elisabeth Tova, First Puzzles HD Pro, The Sound of a Wild Snail Eating by Paul. Bookmark the permalink.